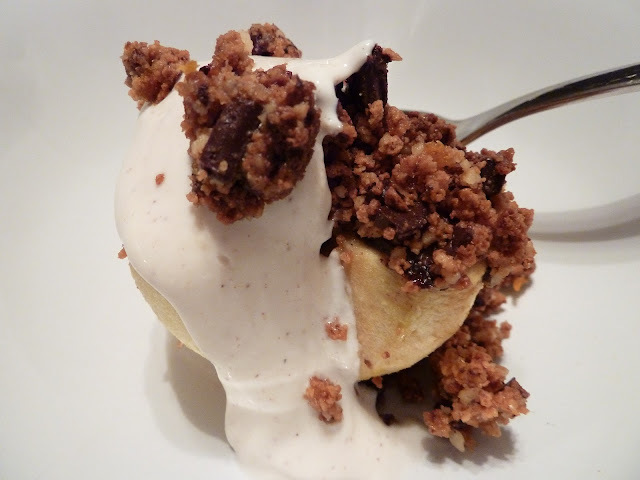 Betcha Can’t: How Do You Like Them (Amaretti and Chocolate Baked) Apples? My husband is a boy from Southie. For those of you who have no idea what that means–it means that he can be a little rough around the edges (in a completely endearing way). It means that what you see is what you get. And it means that, though he has come a long way since his days in rough playgrounds (with even rougher kids), the place shaped who he is and has contributed to many of the qualities I love most about him. Now, admittedly I may be stretching the rules a little here….after all, no one is eating apples in this scene. Perhaps a more inspired recipe might have included a Celtic twist (since Southie was settled and shaped largely by the Irish), but since Good Will Hunting is, at it’s heart, simple, authentic and not forced, I decided that staying true to that spirit was the best way to approach the recipe. You’ll find it’s super-easy to make, with easy-to-find ingredients. The amaretti cookies are a yummy Italian treat—crunchy with an almond flavor and sweet enough that they leave no need to add extra sugar to the recipe. And, since it only makes two servings, it’s the perfect dessert for a movie date night at home. If you haven’t already seen it (and even if you have), Good Will Hunting should be on your short list. Love, love, love apples in desserts. This kind of dish is right up my alley! And I did like Good Will Hunting. Wow, this sounds absolutely divine. Love that you included the actual movie scene too (I did in my post as well). Makes it that much more real! I can just about taste the crunch in my mouth! Looks so good! I knew the second I read your recipe title, what movie you meant. One of my all time favorites. EVER. Such a great line and scene (I forgot how stupidly funny Casey Affleck was in this!) And oh man, they all look so young – I going to rewatch it this weekend. I’ve refueled my crush on Ben Affleck this year with Argo – another amazing film. OK – the actual recipe looks so very good yet simple to make – somehow I don’t make baked apples enough and will start back up with this recipe. I had forgotten how much I LOVE the movie until we re-watched it recently…it really is so good! Another of my favorite lines (again delivered by Casey Affleck)”my boy is wicked smart” (without the ‘r’ of course). I don’t live there anymore and I realized how much I miss that darn accent(though I get huge doses of it from hubby :)). I think the topping would also be yummy on an apple pie…. Your apple recipe with amaretti sounds great, two of my favorites. Love your discussion of South Boston. Good Will Hunting is a great movie that can be watched many, many times. Well, I am SO excited that you’re SO excited about the recipe :). Let me know what you think! (As I mentioned in an earlier comment, the topping would also be yummy on apple pie or crisp).